Jason Vieaux has performed as a soloist with over 100 orchestras and has premiered new works by Avner Dorman, Dan Visconti, Vivian Fung, and José Luis Merlin, among others. The winner of the 2015 Grammy for best classical instrumental solo recording, he has recorded thirteen albums, including a collaboration with bandoneonist Julien Labro and a Ginastera Centennial album in October 2016. Recent and future career highlights include performances with the Philadelphia Chamber Music Society, Amsterdam's Concertgebouw, the Chamber Music Society of Lincoln Center; and the Bard, Caramoor, Ravinia, and Strings music festivals, among others. Mr. Vieaux was the youngest first-prize winner in the history of the prestigious Guitar Foundation of America International Competition. 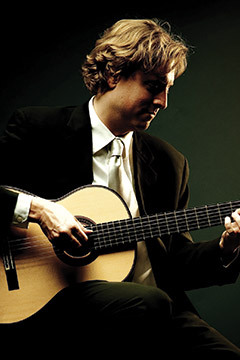 A Naumburg International Guitar Competition prize winner and the recipient of a Salon di Virtuosi Career Grant, he was the first classical musician to be featured on NPR’s “Tiny Desk” series. In 2012, the Jason Vieaux School of Classical Guitar was launched with ArtistWorks Inc., providing one-on-one online study for guitar students around the world. In 2015 Mr. Vieaux was invited to inaugurate the guitar program at the Eastern Music Festival. He has taught at the Cleveland Institute of Music since 1997, heading the guitar department since 2001. Mr. Vieaux joined the faculty of the Curtis Institute of Music in 2011, co-founding its guitar department.